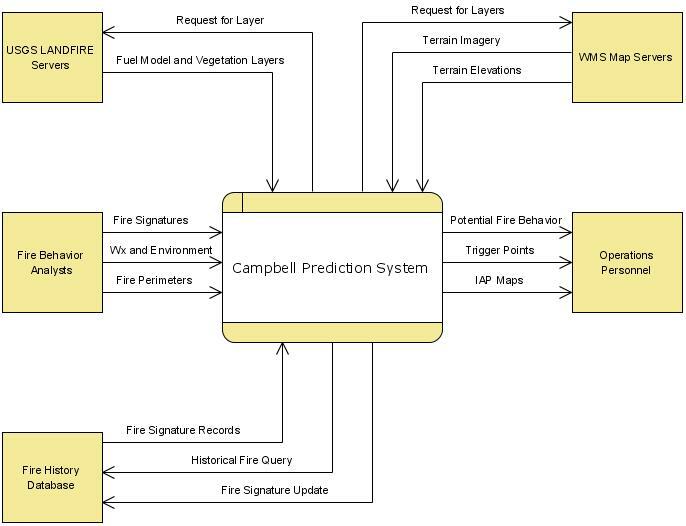 The Campbell Prediction System (CPS) is a practical way to use on-scene observations to determine future fire behavior with support for strategy and tactics to contain the projected fire. The observed fire behavior functions as a baseline for fire behavior predictions. Scientific analysis using fire science and environmental conditions replaces intuition providing the basis for developing tactics. This combination of observed fire behavior and proven fire science establish the basis for acting on the fire’s potential. The Campbell Prediction System provides the logic and language for better understanding the potential of a fire and allows more strategic tactics to be formulated for where and when to intercept and stop the fire’s forward progress. The current CPS software, Wildfire Management Tool v3 (WMT version 3) provides a view of the primary forces acting on a fire. This includes a Haul Chart showing computed flame lengths and rates of spread, and an animation of fire paths depicting what a fire wants to do. However, it lacks the capacity to deliver on one of the key precepts of CPS: Learn from the past; Predict the future. WMT would greatly benefit from the capacity to perform pattern matching of past fires behavior to determine the expected behavior of future fires. Photographs of wildfire can be used to document fire behavior. Current smart phone technologies provide cameras that embed rich metadata in their photographs. This metadata, stored in the Exchangeable image file format (Exif), can include important information for georeferencing the photograph. This georeferencing data coupled with the photographic imagery of the wildfire can become the basis for capturing fire behavior observations. A fire behavior observation coupled with the fire environment data (fuels, terrain, humidity and weather) creates a fire signature. Establishing a database of fire signatures would provide the basis for data mining past fire behavior patterns. This could then be used to estimate future fire behavior. Querying the database for correlation with the current and projected fire environments would show results of similar fires (e.g., photographs, flame lengths, rates of spread) and allow review of their behavior. The following use case diagram depicts, at a high-level of abstraction, how the system serves the needs of various user classes. BO-1 Provide an effective training tool for the Campbell Prediction System method. This tool should be usable by both the student and the teacher. BO-2 Provide a system, to be used on active fires, that reduces loss of life and improves the odds of suppression efforts through the application of tactics derived from the Campbell Prediction System. BO-3 Promote the use of the Campbell Prediction System on the fireground. BO-4 Create the opportunity to rewrite or update the Campbell Prediction System book with this software as significant addition to the current text. SC-1 Prevention of firefighter burnovers and fatalities. SC-2 Adoption of CPS by local, state and federal agencies. SC-3 Adoption of CPS in Europe and Australia. SC-4 Requests for software training, documentation and support. SC-5 Requests for CPS books. CN-1 Fire behavior prediction tools that work without accurate fuel models. CN-2 Fire behavior estimations should augment current state-of-the-art fire modeling. For wildland firefighters and incident command personnel engaged in the suppression of wildland fires who need tactical decision support tools to ensure the safety of firefighters and the effective use of firefighting resources the Wildfire Management Tool is a decision support system and visualization tool that estimates the potential fire behavior on the fireground based on the CPS methodologies; unlike BehavePlus and FARSITE et al this product uses past and present fire behavior observations to predict the future fire behavior. AS-2 Cameras provide adequate Exchangeable image file format (Exif) data to properly geo-reference photos on the globe. The following context diagram depicts the boundary and connections of the system being developed and everything else in its universe. Figure 2. CPS Context Diagram. The system will learn to classify fire behavior based on actual fire behavior observations (ground truths) collected from the fireground. The system will blend the technologies of GIS and data mining (machine learning) to predict potential fire behavior in the unburned landscape. This information will be used in the planning of safety and suppression efforts on the active fire. To accomplish the above, the system will need several inputs. First and foremost are the fire behavior observations. These observations are both spatial and temporal. They describe when and where the observed fire behavior occurred. Each observation includes flame length, flame type (head, flanking, or heel), weather conditions and plume effects. Conditions defined by the landscape will be extracted by using GIS technologies. A primary source for fire observations will be geo-tagged photographs. The system will allow the user to register, or georeference, the photographs to the virtual earth. After georeferencing, the user will create fire observations by locating, measuring and defining the flames depicted in the photographs. The photographs will be uploaded to a central repository. For environmental inputs, the system will consume standard GIS raster data layers such as elevation, slope, aspect, and fuels. Raster layers may also include fuel temperatures in the form of georeferenced aerial IR imagery. Additional GIS layers may include raster datasets describing fuel treatments and suppression efforts. The fire perimeter and the fire behavior observations will be represented in vector data layers. Global data inputs will include wind, weather, and fire danger information. This data may be temporal in nature, varying from day to day or from time of day. The intersection of a fire behavior observation with the other spatial and temporal input layers produces a list of attributes which become an example, or instance, of fire behavior to the machine learning scheme. All of the instances collected over the life of a fire become the training and test data used in the learning scheme. From these instances, the system will learn a way to classify potential fire behavior in the unburned landscape. The system will retain the fire behavior observations, photographs, and fire history in a persistent database. Over the life of the system(s), the history of several fires can be accumulated and mined for information. 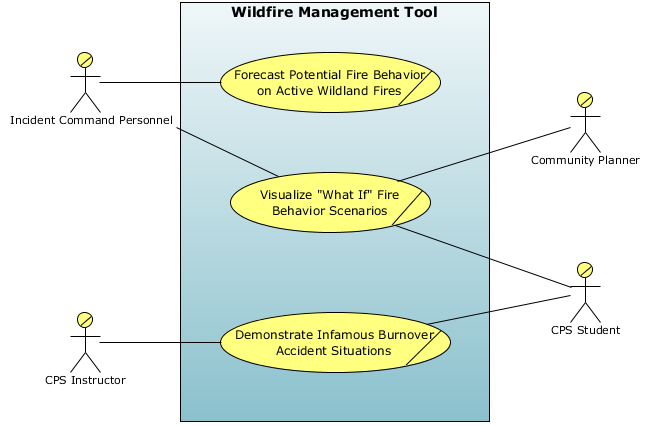 During initial attack, or when fire behavior observations are difficult to obtain, a model fire can be selected from the database and used instead. iPhone and Android visualization tools TBD later. Quality Product is designed to promote CPS methods and showcase NASA WorldWind capabilities. Cost Open source project developed out of personal budget; budget limited to domain support and development tools; funds for supporting development of Internet database support is limited. Features Complete freedom to explore technologies and methods to best implement the feature set. Copyright © 2014 Bruce Schubert, http://www.emxsys.com.